Hooray for six years, thousands of posts, and not NEARLY enough pictures of my buddy Bear! Keep on keepin' on, Farmgirl. You're a star. Oh, my. That #100 is an AMAZING photo. I'd love to transfer that image right onto the end of my barn and see it out the window everyday! I, too, am glad you can spend that much time blogging. I dig it. Congratulations on six years of blogging! I'm so glad you started a blog so we could "meet" and have fun conversations (by e-mail.) Maybe in person someday! We are so glad you're here. I enjoy it all! Especially the recipes and the cute photos...and stories about the farm. happy blogaversary!!! glad to be a fan of this blog. and now my 8 year old daughter is too! She is quite the lover of animals. woot!! Congratulations on six years, your blog remains one of my favorites, always something new and cute happening. I look forward to many more years. Six years! That's something to celebrate! It's wonderful to check in on your world every day and live vicariously through you. I'm in the suburbs of DC -- and it's so fun, and humbling, to see what life's like in rural America. You work hard! I especially love the pictures of the donkeys and the sheep. Those babies are all so precious. Happy Blog-aversary! Thank you for sharing your life. Congratulations! And thank you for such a wonderful blog(s). My boys love all the cute animal photos, and I love, love all your wonderful recipes! On another note-I am about to make a rather large stock-piling Amazon purchase! Do you know if I can link to Amazon through your site and select items already on my Wish List and have you get the credit for them? Or do I have to do new searches for those items? I'd love to help fund the treats! Six years! That's a long time in blog land - well done! I started reading Farmgirl fare about a year and a half ago, I went back to the beginning and read every single post. I can't wait for the next six years! Congratulations, Susan, on 6 great years. 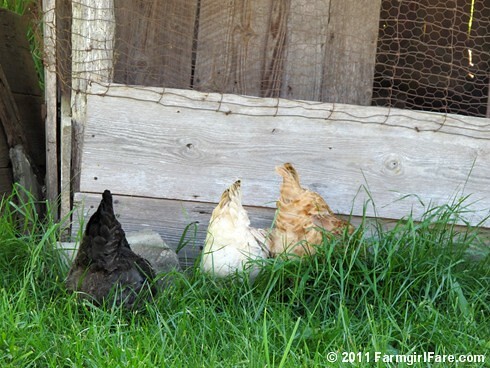 I think I have been reading and enjoying your Farmgirl Fare blog from close to the beginning. And, I have followed your Garden blog from the start. Love them both. They kind of start my day. Keep up the good work, both writing and photography. It's been a wonderful ride. Thanks for asking about buying items on your amazon Wish List through a Farmgirl Fare amazon link. The answer is yes, if you start your amazon shopping spree using one of our links and purchase items on your Wish List, we will receive credit - as long as they aren't already in your shopping cart. We really appreciate your support! Congratulations Susan! and thanks for introducing me to so many great ideas that I can't even list them here. I do delight in reading your words. Many, many more happy years! wouldn't be any where else. LOVE this blog!! thanks Susan for taking the time out of your very busy schedule. I love the farm photos, stories, and book reviews, but what I love absolutely most are your recipes!! They are what keep me coming back again and again... Thank you for many wonderful meals!! I truly hope to see a recipe book from you in print some day soon! Happy Anniversary and many more! In your daily dose of cute you bring me a daily smile. Thanks! Happy Blog-aversary !~! Six is a great age; thanks for sharing your lives with us. Wow, Susan... I love it all, yes, definitely the recipes... and of course the photos, but most of all the honest and dear way that you say things. Your writing, your stories, and they way that you say things is a gift to all of us. Thank you. Congratulations!! I've been "with" you lmost since the beginning and still love every minute. Of course, I am very partial to a certain DDDonkey but everyone else is such fun, too. Your writing, cooking and photography brings a smile to my every day. Well, it (almost) goes without saying that I am a huge fan and of course, enormously grateful for the experience which afforded me the absolute delight of actually meeting you and all the critters! I was enormously lucky you said yes to the idea and didn't think I was some kind of 'virtual' weirdo! Love all the pics, recipes & posts; have often been crying with laughter and sometimes gut-wrenching sadness along the way. But most of all, your friendship helped me work out a few knots back home and I 'met' the man I am to marry, right there in your Shack! So, your blog changed the course of my life forever. Now that's an accolade! I have a question about the Amazon link. If I go to amazon.com using the link shown on your blog and then bookmark it, can I just use that bookmark in the future? Or do I have to come to your blog first every time? Yes, if you bookmark a Farmgirl Fare amazon link, such as the ones in this post (you'll see the words 'farmgirl fare' somewhere in the link url) and then you open that link to begin your future amazon shopping trips, we will receive the credit.